Me: What should I <insert conundrum regarding a book>? Hubby: Llamas. You need llamas. See, hubby and I have been fairly obsessed with llamas (and alpacas, to be honest, but llama is more fun to say) for some time. In fact, now that llamas seem to be making a little foray into the world of culturally acceptable awesome (reference seeing llamas on more things of late), I’ve been tempted to make hubby a shirt that says “I lloved llamas before it was cool.” Or something. I can hear you wondering exactly how this has anything whatsoever to do with contemporary Christian romance. When I was writing the most recent Peacock Hill book, A Heart Realigned, it turned out that Azure (the heroine) was a bit of a runner. Have a problem? Run away. That was kind of her philosophy. And so I needed a place for her to escape to after leaving her parents house in Arizona. Enter her grandparents. Who she’d never met. Who own a ranch in Northern New Mexico. 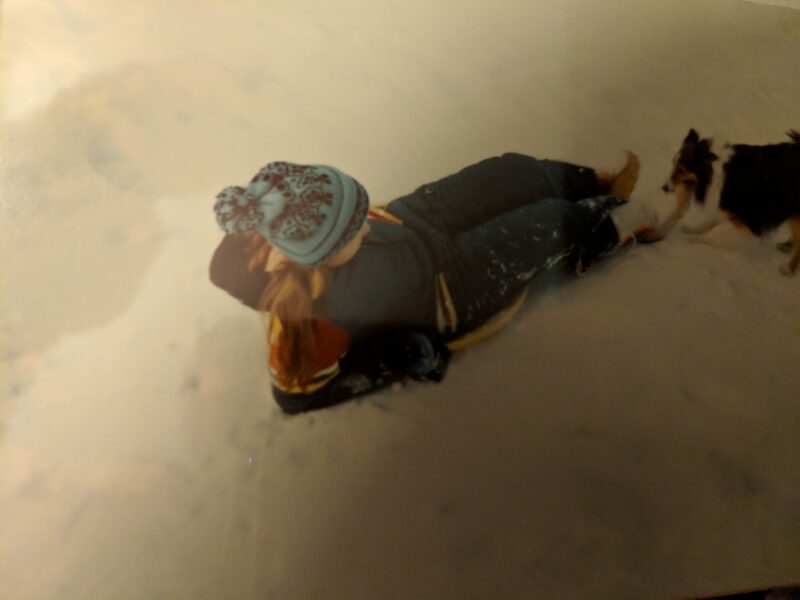 Here is me sledding. And being herded by our Sheltie, Prince, in some of our lovely New Mexico snow. Why Northern New Mexico? Well, mostly because I grew up there and lately I’ve been longing for a little taste of home. So getting to visit virtually while I scoped out places to set the Hewitt’s ranch was soothing. And it turned out, when I was finished with Azure’s visit there, I had a Christmas novella to write. And I needed somewhere to set it. And Northern New Mexico is awfully pretty in the winter (well, all year, honestly, but they get so much lovely snow in the mountains that it’s hard to beat.) So why not set it at the Hewitt’s ranch? I hadn’t intended, really, to do a series with Azure’s siblings, but that’s what seems to be happening. Which just meant I got to do even more arm-chair vacationing to Northern New Mexico. I grew up in Los Alamos, which is a lovely small town full of nerds and their families, who also usually end up being nerdy. I’m sure there are some non-nerdy people who live there, too, but I’ll admit not remembering them. As much as I am a big fan of nerd pride (read my books, there’s usually at least one in there. Cause nerds are awesome), there’s nowhere in Los Alamos to put a ranch. So I wandered south west a tad to the Taos area to plop Rancho de Esperanza (Ranch of Hope) on the top of a nearby mountain. If you’re from New Mexico, I’ll apologize now, I took liberties. I made up a mesa. But there are mesas there, so it’s not a huge stretch. 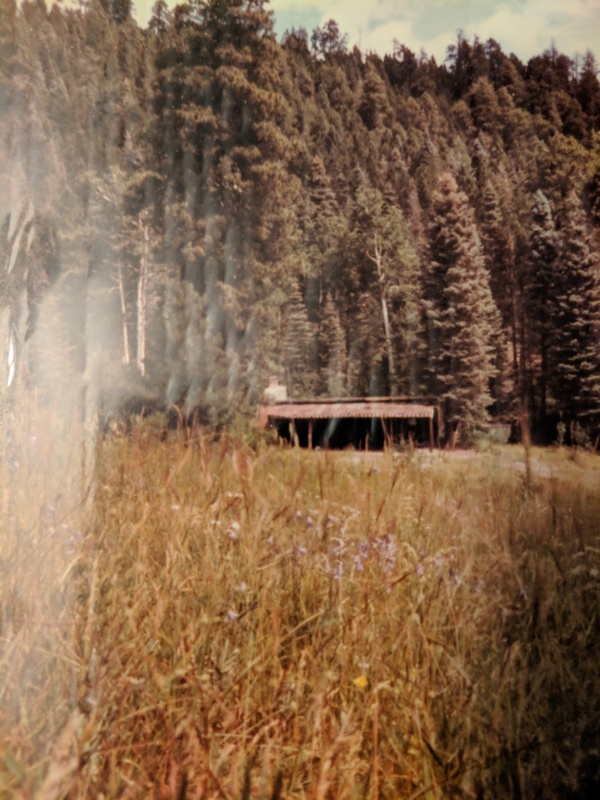 I started digging through my old photo albums, thinking surely I would have a ton of pictures of the landscape around where I grew up (which is not altogether that much different than the landscape around Taos.) Bzzt. Apparently, back in the stone ages when you had to buy film and then pay to have photos developed, you actually wanted people in the pictures you took. So there are a few nice landscape shots, like that mesa over there, but the rest? They’re all me and my sister in our living room or backyard, and as cute as we were? Not super conducive to setting details. If you think of anything when I say Taos, you probably either think of skiing or the church pictured at the right. 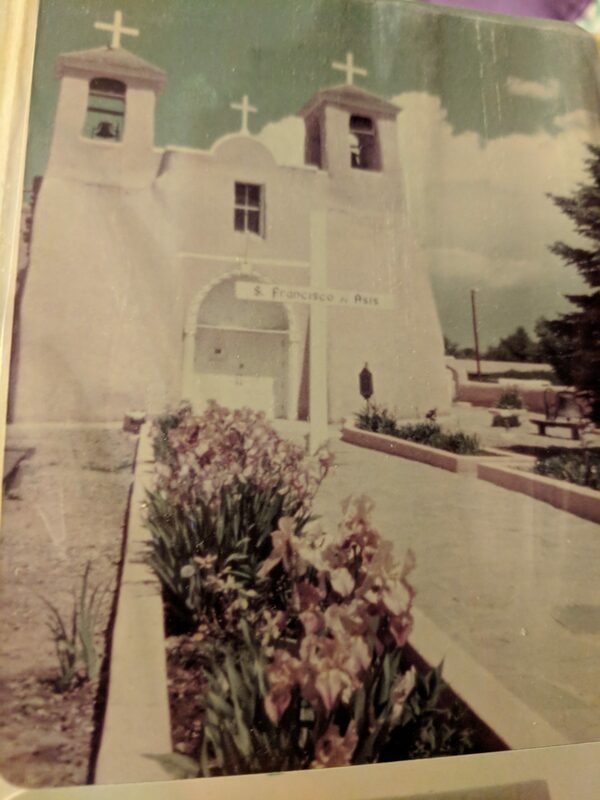 That’s the San Francisco de Asis church in Rancho de Taos, which is actually a little south of Taos. But it’s still factored into my story, because it’s one of the landmarks you simply can’t escape. It’s beautiful. And everyone who goes to Taos stops to photograph it. At this point, you’re probably wondering what any of this has to do with llamas. Well, Rancho de Esperanza doesn’t have a llama herd. Yet. But they’re going to down the line and finally, finally, my husband will have his llamas in one of my novels. 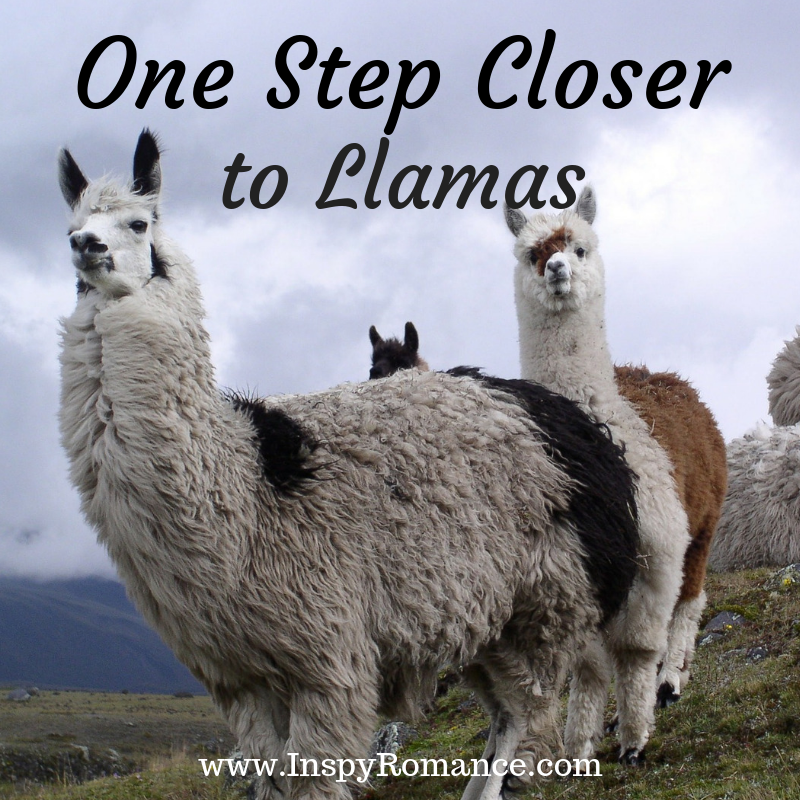 But if you want to get to the llamas, you should probably start with the first book in the series, so you don’t get as lost as this blog post encourages you to. 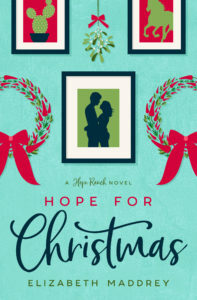 The great thing is, you can read Hope for Christmas (Hope Ranch book 1) very soon in the box set A Christmas to Remember. This box has novellas by eight InspyRomance authors in it. I’m very excited for you to get a chance to read it, because they’re all quite good. He wasn’t sure what he was looking for. She wasn’t looking for anything. Cyan Hewitt drifts onto his estranged grandparents’ New Mexico ranch in time for Thanksgiving… and stays. As a cyber security consultant, he can telecommute, so why not from here, where his restless soul is soothed and his heart is awakened by the attractive ranch housekeeper? Maria Sanchez works at Rancho de Esperanza to provide a stable life for her son. She’s content—mostly—in her roles as housekeeper, part-time student, and mom, but when her precocious seven-year-old is diagnosed with diabetes, her world shatters. There’s no time for distractions from the long-term visitor who’s stirring a longing in her for more. Cyan may think her faith and courage are inspiring, but Maria feels vulnerable. Relying on others has only ever resulted in broken dreams. Christmas might be a season of hope, but does she dare risk everything for love? 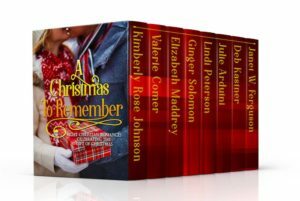 You can pre-order A Christmas to Remember (and consequently Hope for Christmas). It’ll be on Amazon only for 99 cents and in Kindle Unlimited. The set releases October 2nd and will only be around for a limited time. I’m sure in the coming days you’re going to get a chance to hear about the other books in the set — but trust me on this, it’s not a set you’re going to want to miss! 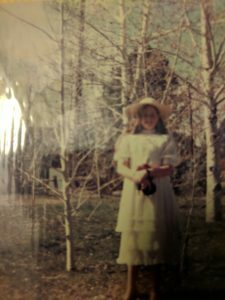 This is me dressed up for Easter by the Aspen trees in our front yard. Of all the things about New Mexico I miss, Aspen trees top the list. Are you going to one in Clifton? I know there is one there and that shouldn’t be too far from you. I keep meaning to go but haven’t yet. Oooh. There’s one in Clifton? That’s closer! I was looking at one in Culpeper and, while I don’t mind driving, Clifton would be way easier! I’ll look into that, thanks! Hi Elizabeth! What a delightful post about llamas, sharing your family’s time in New Mexico, and nerds. Love the first picture of your Sheltie Prince herding you. We have had two Shelties McBeth and Penny, who loved to herd their children. I also enjoy seeing llamas at the county fair. There are several llama farms in Michigan and northern Indiana. Yes in our area llamas are considered awesome. Been married to a nerd for 45 years (just have to love them). I briefly drove through New Mexico on a road trip to California. Open blue skies of all different shades, not wonder the Hewitt kids are named a shade of blue. (Kind of answered my own question.) Enjoy reading your Peacock Hill series. Dear Readers: A Christmas to Remember order your set today. Eight fantastic novellas written by eight talented Inspy Romance writers. Best Wishes. Shelties are the best dogs. They just are. Hi! How funny, like Wemble, one of my best friends loves llamas too! I preordered the Christmas set when I first found out abut it, I can’t wait! Dearest Elizabeth…..I cannot tell you how much fun I had reading this post!! I have a running joke at my office whenever someone comes to my desk and says “question” I immediately answer 12…..one of these days I may be right…and I am seriously considering changing the answer to llamas now!! I am excited about reading your story!! We love the Llama Llama books! I was so sad when the author passed away (last year I think, maybe the year before.) They are on almost constant rotation at bedtime here. Thanks for New Mexico tour. I’ve never been there so it was fun to hear about it. My grand daughter has a really neat llama shirt. I didn’t realize they were in now until I saw her shirt. You’re welcome! Thanks for swinging by! I ordered this collection the minute I saw it, but your Hope for Christmas has really whet my appetite to get a hold of it even more. I love the cover, whoever does your covers does great work, totally charming. for the year I was born, in Texas. One of my favorite things about reading, I can travel the world from the comfort of my own easy chair. Congrats on the new collection Elizabeth! What a fun post. I love the idea of the t-shirt for your husband. Enjoyed reading this. My grandkids love llamas. I read a book a few years ago about someone who inherited an alpaca ranch. I don’t remember the book or the author, but it was Christian fiction. Ooh. I’ll have to look for that! I look forward to seeing how you introduce llamas to the Hewitts’ ranch! I haven’t been to Los Alamos, but my dad used to go there on business trips (he was a nerd), and a really good friend grew up there. Try The Hungry Jpeg or Design Bundles for the llama art for that T-shirt. They’re all over the design sites! Seems a good enough reason to me! That was a fun post! Your hubby deserves his llamas. You could also knit him an alpaca sweater–we’ve seen some great knitting on Facebook lately, right? BTW, my cousins in Washington used to have llamas, but I missed out on meeting them. Los Alamos sounds a lot like the wonderful town of Eureka! And I do want to make him something out of alpaca, but man it’s pricey! LOL! The two of them are definitely a pair. I think we have an alpaca ranch near us. It was a shock to see them while driving in the country. I like the siblings all having shades of blue for names. I love any shade of blue. I’ve already pre-ordered the boxed set and really enjoyed reading your explanation. But now I have a question for all of you authors: why so many single parents books? Oh interesting. I don’t actually tend to write a lot of single parents. I think this is my 2nd, maybe 3rd, out of 25 books. (I went and checked, this is my 3rd. So if you’re tired of single parents, avoid Operation Fireworks and Operation Back-to-School (although she’s a widow with kids if that changes anything?)). There is at least one other single parent story in the box. Sorry! Does that help at all? There are non-single parent books out there though — promise! I didn’t mention the blue name thing before bit that definitely got my attention too. And as for reasons to give blue names, I’m sure you’ll find something creative. I pre-ordered this set, but am reading a copy now. I’m actually halfway through your story, and it’s really good! My brother-in-law had a llama, but it kept scaring the cows into a corner, so he had to sell it. It was fun to watch though. I’m with your husband – I loved llamas before they were cool! I fell in love with them 30 years ago. I’m a fan of alpacas, too. I’m looking forward to a llama in one of your future novels!